March 30, 2011  Foreign journalists covering events in the Libyan capital, Tripoli, are facing increased government pressure. The regime's tactics are a kind of relentless psychological warfare that can seem absurdly funny at times. But journalists are worried that the incitement could lead to violence. March 29, 2011  Dozens of governments and international organizations are in London to discuss the future of Libya, and ways to get Moammar Gadhafi to step down. President Obama addressed the nation Monday to explain the U.S. mission to protect the Libyan people from immediate danger. Libyans are closely following the developments. March 28, 2011  Rebels in eastern Libya are moving west toward the capital Tripoli. Shops there are closed, and residents are forced to stock up on food and gas when they can find it. The bombings by coalition airplanes also started up again in the capital. March 27, 2011  There are reports that Libyan rebels have moved beyond Ras Lanouf and are now heading toward Sirte, Moammar Gadhafi's hometown. March 27, 2011  After taking the town of Ajdabiya, rebels have now moved in to Brega and, according to reports from there, they continue to move forward toward Ras Lanuf. In Tripoli, the government of Moammar Gadhafi called the loss of territory "a tactical retreat." March 16, 2011  NPR's Lourdes Garcia-Navarro saw the rebels' mood change dramatically during the three weeks she spent reporting on the revolt against Libyan leader Moammar Gadhafi. As Gadhafi's forces gain ground every day, the rebels' bravado has faded to fears of abandonment. March 10, 2011  Victims of the aerial bombing campaign in Ras Lanuf and Brega come into the hospitals fast. Doctors say casualties have doubled since intensive bombing campaign started — and at least 60 percent of casualties are the results of air strikes. March 9, 2011  In eastern Libya, Benghazi is a city on the edge — but the edge of what no one is exactly clear. On one hand, civil society is stepping in after the collapse of the state. But there are fears Gadhafi loyalists are trying to sabotage the fledgling government. March 8, 2011  In eastern Libya, the Provisional Transitional National Council has announced it is the legitimate government of the country. But it is struggling to organize itself and exert authority. There are also splits within the rebel army as well. March 6, 2011  There has been fierce fighting Sunday in the pro-Gadhafi stronghold of eastern Libya. 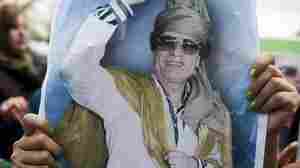 Rebel forces met with strong resistance from the army loyal to Moammar Gadhafi. March 6, 2011  Rebels in Eastern Libya suffered a serious setback Sunday when they were ambushed by forces loyal to Col. Moammar Gadhafi in the city of Bin Jawad. The attack left the rebels' hold on the nearby city of Ras Lanuf in jeopardy, and halted the rebel advance on Gadhafi's hometown of Sirte. March 5, 2011  There are reports of fresh fighting between rebels and forces loyal to Moammar Gadhafi on Libya's Mediterranean coast. One of the latest battlefields is the oil port of Ras Lanuf. It was initially seized by rebels after the uprising in mid-February, but then recaptured by Gadhafi loyalists. Now the rebels are back and battling for control. March 3, 2011  Libyan warplanes struck against the Mediterranean oil port of Brega today — but the town remains in rebel hands. March 2, 2011  Forces loyal to Libyan leader Moammar Gadhafi have retaken the eastern city of Brega. Rebels in the east fear this is the start of a broader offensive against towns that have toppled Gadhafi's rule.